With films now like Ghost in the Shell (2017), Alita: Battle Angel (2019), Death Note (2017), and the upcoming Akira & Neon Genesis Evangelion in development: What's your take on US Hollywood studios now making live action anime adaptations? My opinion is that this is not something we Western fans asked for, especially ones like me who grew up with it during the 90's. Films like 20th Century Boys (2008-2009), Bleach (2018), and Attack on Titan (2015) for ex. are much better adaptations that are best left in the care of the culture that it was made for. But they also had some terrible ones like Devilman (2004) and Gatchman (2013). I'll admit that films like The Guyver (1991), Guyver 2: Dark Hero (1995), and Fist of the North Star (1995) were films that I liked when I was young but when I watch them now they're just "corny" to me. when's Robotech live action coming out this time? I almost feel its beneath even talking about. I have zero interest in any of this. That Battle Angle movie...oh man, no way. That is so ratchet I almost puke looking at it. Who talked who into spending some insane pile of money on making a movie out of a manga almost nobody read? Or was it the OVA that ended at two episodes? And Ghost in the Shell...what's even the point? Even the people who make the good stuff have a hard time making it consistently good and now you want to 20x the budget just to make it (mostly) live action? Who is this for? Hollywood can't even seem to get Superman right anymore and you want to try this? Is it to make it dumber? That would actually make sense...you could really broaden the market if you took out all the plot and just made a Running Man sort of music video version of Ghost in the Shell. Forget PKD, just make it all cyber dolls and exploding brains and make sure you can sell toys. Let's all forget about the abomination that was Dragonball Evolution. Made for a passable action/comedy adaptation. Haven't seen this one yet but but it's not exactly a City Hunter live movie. 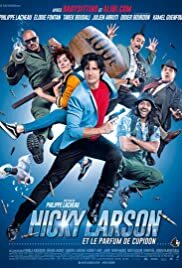 City Hunter was heavily edited and adapted for the French kids' audience back in the 90's under the name Nicky Larson and this is a movie about the French adaptation, not fully respectful of the original material. I've seen it mentioned that James Cameron is a huge fan of BAA. But yeah...I have no interest in any of this. I already know in a few years after the comic book movies come and go Hollywood studios next commercial garbage will be nothing but anime/manga adaptations that nobody asked for. While I would love to see an adaptation of a film like Akira, I know already after seeing some of the crap they have made that it will be garbage. Also the other situation involved is that so many of these "groundbreaking" animes were done just way too long ago and they have been remade in anime form or concepts have been used and these are just no longer fresh and matter. While they may look amazing like GiTS they are just going to miss the point and have another POS to whip Christophe Waltz in again. What a shocker, he was good in a Tarantino film, thats not hard to do, look what they did for John Travolta. Then they use him in everything and now everybody realizes why he wasn't in much before or nobody cared about him, he wasn't that good to begin with. And they are banking everything on these two half actors to make one. Just like GiTS, scar-jo couldn't pull it off and keep that movie alive how can these two actors do it. Yeah, live action Guyver was at least a shlocky strait to video live action version of a shlocky strait to video anime. Budgets low on both, etc. What exactly do you want out of a live action anime adaptation? Why start with Akira if it’s not going be Otomo’s art style? Or that OST? Or those cool tracing motorcycle lights? I’m asking this because while many works translate from one art form to another (such as all the great movies and anime based on books) I genuinely have no interest in seeing the same thing all remade by some opportunistic white people 30 years later in another country. Why? What do you want out of it? What did Akira fail to do on...honestly ANY level that would lead to to wanting a remake of any kind, let alone from the clueless grindhouse of anime remakes? What can James Cameron put in Akira that makes it anything other than an insult to the original? You know he’s just going to set it in LA and make the main characters marines and/or go underwater with it or something else he’s done before only this time it’s more expensive. What’s more desirable? Bastardization or mimicry? Is there another choice? To me quality isn’t even a factor. Good or bad...it’s already artistically bankrupt. “Good” CG isn’t going to save it. Remakes are fine if they have some reason to exist other than “some people don’t watch anime” which isn’t a good reason. Why sell Akira to people who don’t like Akira? People who don’t like anime don’t get to see Akira. People who don’t like classical music don’t get to enjoy it. Making a rock opera out of The Barber of Seville isn’t a way to broaden the market for Rossini. It would just be a way to give some uninspired composer a starting point for his hackery. To me quality isn’t even a factor. Good or bad...it’s already artistically bankrupt. “Good” CG isn’t going to save it. Remakes are fine if they have some reason to exist other than “some people don’t watch anime” which isn’t a good reason. Why sell Akira to people who don’t like Akira? People who don’t like anime don’t get to see Akira. People who don’t like classical music don’t get to enjoy it. Making a rock opera out of The Barber of Seville isn’t a way to a few years ago broaden the market for Rossini. It would just be a way to give some uninspired composer a starting point for his hackery. If he's sure a fan, why used the modified names and title? GUNNM (gun/dream) sounds more intriguing that Battle Angel. I couldn’t make it through that extremely long Akira trailer. Even the movie itself didn’t have a nearly eight minute build like that. I wonder how much longer an American Akira would be today. I mean, how long would each film in the trilogy be, sorry. One is better off reading the Manga of Akira. While the trailer is nice its just fan stuff to make others excited about nothing. I actually saw that in a theater in The Philippines when it was first released. There had been talk for DECADES that a Western adaptation was going to happen for that (and I mean, REALLY Westernizing it by changing the Yamato to the USS Arizona!!!) So far that remains dead in the water. That around the same time the Golgo 13 had come out for the NES and best friend and I were having a lot of fun trying to beat it--we were floored when TBS (Ted Turner's cable network, not the Japanese station) aired it one Saturday afternoon!!! 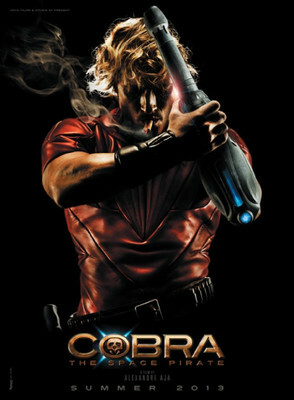 One adaptation that recently got the axe was Alexandre Aja's Space Aventure Cobra. Years ago, it was announced and a promo poster was released . . .
if akira and eva were made it wouldn't really work as it would be better off as an animated feature like it is. It would be too CGI heavey. That Cobra is a real shame, I was looking forward to it. That is is more f'ed up if Akira were to look like Iron Man.